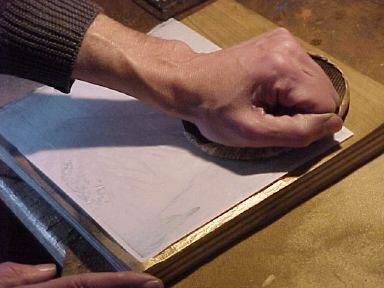 Printing effectively with metals is a difficult job; they do not lend themselves to the same techniques used for the other pigments on a print, which are usually dissolved in a liquid medium (water or glue) in order to be applied to the paper. 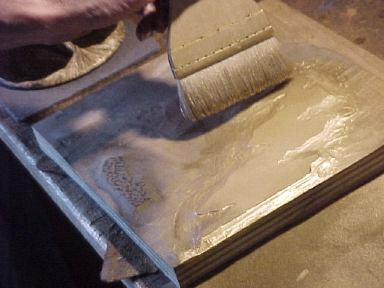 Here is an outline of a basic technique for printing powdered metal. 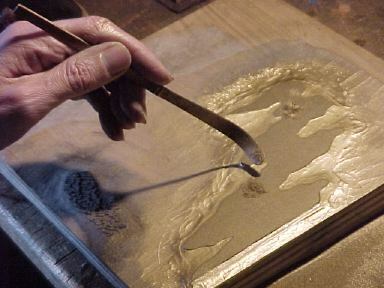 The example used is the application of a fine bronze powder on a reproduction of a print by Totoya Hokkei. 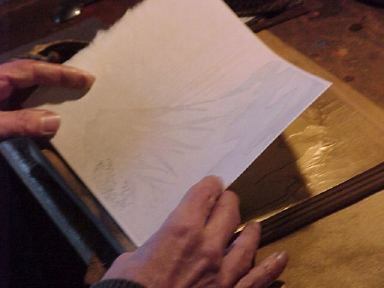 The powder will be attached to the print with 'nikawa' (gelatine). The first step is to prepare a solution of gelatine in water. It is difficult to describe the 'recipe' for this, because the strength of the glue will be determined by such things as the fineness of the metal powder in question, and the heaviness of the paper, etc. I am using an extremely fine powder in this example, so mixed the glue rather thinly. 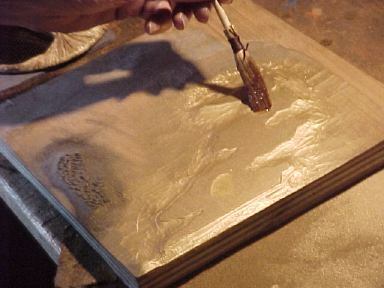 Use a normal printing brush to spread the glue mixture out evenly over the surface of the block. Lay the sheet aside. 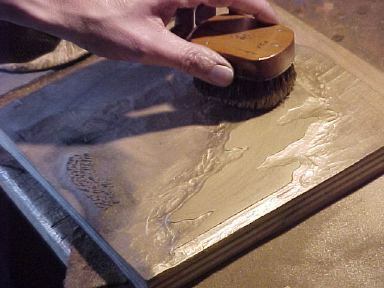 Now moving quickly, before the glue has a chance to set, put a dab of bronze powder onto the block. 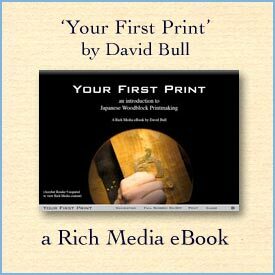 Before coming to Japan many years ago, I had been worried that I would find that the old woodblock print craftsmen would be quite secretive about their work. 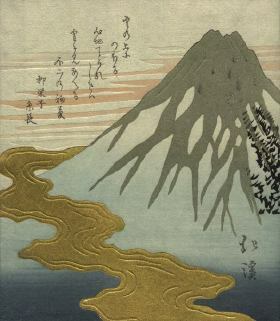 I expected that it would be difficult for me to learn many of the techniques of woodblock printmaking, because I was an 'outsider'. I persevered though, and through a mix of my own experiments, watching others carefully whenever I got the chance, and some help from one of the older printers who grudgingly 'gave in' one afternoon and let me into his workroom for a very short demonstration, have arrived at the stage where I can now reproduce what I see in the old surimono prints. If you have just finished reading this tutorial, you may be asking yourself, "Well, so what? That was pretty simple. This is a 'secret' lost art that took David decades to uncover?" Well ... I'm not sure how to answer your question. Reading through the description on that previous page, yes, I have to admit that it does seem pretty simple. But reading and doing are two very different animals; printing one little test sample is perhaps not too difficult - printing a run of 200+ consistent copies is something of a different story. In this Encyclopedia I have freely given of whatever I have learned over the years, but as I get a bit older, I am more and more coming to understand something of the viewpoint of the older men here. Would you like to know 'how I do it'? Sure, here you go. But knowledge given that way is actually nearly worthless. Doing 200 copies of the bronze powder on that Hokkei reproduction called on nearly everything I have learned about printing over the last 20 years - the ability to sense tiny differences in the moisture of the paper and how to adjust the baren pressure as a result ... the ability to deal with the brush when the gelatine started to thicken as I went along ... just what to do when a certain 'patchy' appearance started to develop in one area of the impression ... Dozens of times during the course of that long day, I was faced with a problem that one thing and only one thing could solve - my long years of experience. What's that, you want to know a bit more about the gelatine mixture? Whaddya think ... will those Yankees be able to repeat this year? I have read one of your articles on the pigment shop of Kazuyuki Matsuyoshi - and I am desperately trying to get hold of Nihonga Mineral pigments. I am a professional artist, living in South Africa, where it is something quite unheard of and no art shop stocks these supplies. PLEASE could you provide me any contact details for ordering these pigments? Thank you for your outstanding work re printmaking! It would have been wonderful to have these kind of information and sharing of knowledge on Nihonga Paint techniques! Have you looked at the BarenForum website? 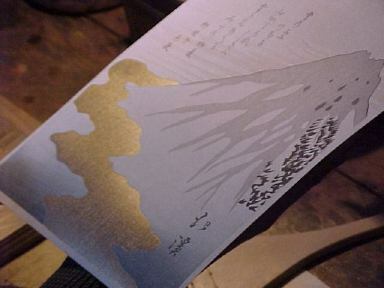 They have an ordering service for products for printmakers, and they have some Japanese powder pigments.